Chadwick Lee Bradford (born September 14, 1974) is a former Major League Baseball (MLB) relief pitcher. He was well known for his extreme submarine-style pitching, and his success in MLB despite his unconventional delivery and the slow speed at which he threw the ball (his fastball was only in the mid 80-mph range). This led to him figuring prominently in the Michael Lewis book Moneyball, which in 2011 was made into the film of the same title. Bradford is played by actor Casey Bond in the film. Bradford was born in Byram, Mississippi. His father had suffered a stroke that left him partially paralyzed, so that he could only throw underhand when playing catch with his son. Author Michael Lewis speculates that memories of his father's throwing motion may have contributed to the development of Bradford's pitching style. Bradford went to Byram High School. Unlike most players who become major leaguers, he had not exhibited outstanding athletic talent through the early years of high school. But his high school coach suggested he try sidearm pitching after learning some tips about the approach from a professional player. This technique brought him enough success to get a spot on the teams of Hinds Community College and the University of Southern Mississippi. The Chicago White Sox selected Bradford in the 1994 Major League Baseball draft, but he elected to stay in college through 1996. The White Sox—the only major league team that had even scouted him—re-drafted him in the 13th round of the 1996 Major League Baseball draft. He made his major league debut in 1998 at the age of 23. In 29 games, he had an ERA of 3.23 with 11 K's in 30.2 innings. In 1999, Bradford made only 3 appearances in the majors while spending most of the season with the Triple-A Charlotte Knights. He was successful as a September call-up in 2000 and pitched in the American League Division Series. Following the season, the White Sox traded him to the Oakland Athletics for catcher Miguel Olivo. From 2001 to 2004, Bradford was a specialty reliever for the Athletics, having success against right-handed hitters. His ERA stayed around 3.00 for his entire career until 2004 when he had a setback. It was said to be because of his mounting back pain which eventually forced him on to the disabled list. In July, 2005, the Boston Red Sox acquired Bradford from Oakland in a trade for outfielder Jay Payton. Bradford, on the disabled list since undergoing lower back surgery March 7, was activated after the All-Star break. For Boston, Bradford had a 3.86 ERA with a 1.414 WHIP in 23⅓ innings. After the season, he became a free agent and was signed by the New York Mets where he was reunited with Rick Peterson, his pitching coach from the Athletics. He had a very solid year in 2006 as a right-handed specialist out of the bullpen, posting a 2.90 ERA in 70 games. On November 28, 2006 Bradford signed a three-year, $10.5 million deal with the Baltimore Orioles. On May 31, 2008, Manny Ramirez hit his 500th career home run off of Bradford (that was one of only 3 HRs allowed all season). On August 7, 2008, Bradford was traded to the Tampa Bay Rays for a player to be named later. With a lot of postseason experience under his belt, Bradford shined in the 2008 playoffs and played a big part in Tampa Bay's World Series run. Bradford pitched in the 2008 World Series, allowing one hit in two innings for Tampa Bay. 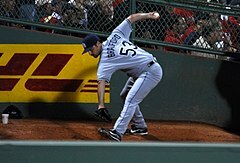 Bradford remained with the Rays into 2009; however, he began the season on the disabled list after injuring his elbow in spring training. Bradford returned in June but shortly thereafter returned to the disabled list, this time after injuring his back while warming up. Bradford was sidelined again at the end of the season with various pains. When on the mound, he was of questionable effectiveness, allowing 22 hits in 10 innings. Largely because of recurring injuries, Bradford told the St. Petersburg Times after the season that he was considering retirement. With no media attention and no interest from major league clubs, Bradford retired and went to work as a coach in Mississippi. In 24 career postseason games, Bradford posted an 0.39 ERA, allowing just one run. ^ "Modern bullpen upscale precinct". Wikimedia Commons has media related to Chad Bradford.